The retail landscape is continuously changing due to novel business models, better technology and evolving customer norms, preferences, and laws. These changes shape specific products, customers and shopping situations in dramatically different ways. As store owners work to understand where retail is headed and how they can serve customers better, it is important to understand that products, customers, or situations will not be affected by these changes in the same manner. Not all people, products or situations demand the lowest prices, quick shipping or a large selection. Some products are heavily influenced by current customer preferences while others are not. New business models may help people in one situation yet not in another. To thrive as a retailer today, one must understand which changes are influencing commerce as well as understand the specific aspects of retail each change is likely to have an impact on. The retail experience that is perfect for one shopper, product or situation may not be ideal for other shoppers, products or situations. We will be exploring the nuances that exist in relation to different products, people, and situations while also examining changes occurring in technology, business models, and customer preferences. These changes and perspectives may be evaluated in a variety of ways and many of these concepts flow between categories. Nevertheless, this is a useful framework for exploring what the future of retail may be like. We do not need to look far into the past to see that the manners in which people have conducted retail transactions as changed and we can study the direction of these changes to help us make guesses about the future of commerce. The number of people that shop online and the types of products they purchase are growing at a rate that will continue to up-end many businesses and industries and create new ones along the way. Retailers that want to stay in business must understand their particular industry’s nuances and the general changes currently happening in commerce. It is important to understand the types of products that are competitive online, the types of shopping situations that are affected by new technology, and which customer segments are influenced by these new trends. Many experts talk about the importance of low prices, excellent service, and same-day shipping. For many products, people or situations, these are vital to compete online. Knowing how to provide the right shopping experience for the products you sell, your target audience, and their current situations is the key to building a successful eCommerce store. It is crucial for retailers to appreciate what their customers want by evaluating their store from the aspects of product, customer, and situation as opposed to assuming all changes will have an effect on each of these in the same way for all businesses. Each product, customer, and shopping situation brings a unique set of retail expectations. Some products need to be touched or seen in person by customers while other products are sufficiently described through text and images. Some items are needed immediately, not in 3 to 5 business days. Many shoppers love to go to malls while others would rather not step foot in one. Customers each have their own set of shopping preferences, at different times, and for different products. Store owners must learn about these differences and how the changes will affect the retail industry. Most of us would not put much effort into finding a deal on two-dollar shoelaces but we would wake up early on Black Friday to save two hundred dollars on a TV. Most of us would skip buying a ten-dollar bottle of water at the local store but NOT if we were thirsty in the desert. Most people negotiate the price when purchasing a new car or house but may not even look at the price of the meal on a first date. It would be unacceptable for tuxedos to arrive even one day late for a wedding but most people would be willing to wait weeks for a delivery of custom-made artwork. These are just a few examples of how specific products, customers, and situations can have an impact on how shoppers think about retail and what to expect. Does the product need to fit just right or be a specific color? If the items is not what was expected, what will I lose? Is it made of a material I prefer to touch before purchasing? What happens if I want to return it? Is it too large to ship? Is enough information provided for an item that isn’t available for in-person examination before purchase? How expensive is it? Do I need advice from an expert to choose the item? Will I need help with learning how to use the product? These are some of the product-related questions customers may ask themselves before deciding where and how to purchase the desired item. Shipping is expensive. Even if the customer does not pay for shipping directly, it still needs to be paid which means the store pays for it and passes the cost along to the shopper. The items need to be delivered to the customer’s house one way or another but shipping items individually may not be the best way. When considering the type of products to sell in your online store, it is important to know the cost of shipping the product and whether or not you will be able to compete with brick and mortar stores that generally ship items in a more efficient manner. A truckload of one thousand products shipped to one storage location is much cheaper to deliver than shipping each of the one thousand products to individual addresses. The last mile can be expensive. Complex products may require extra explanation and descriptions. This can be a benefit for online retailers if a limited number of people have the expertise needed to help choose the right product and online communication through their site is sufficient. In contrast, when selling an item that benefits from face-to-face product interaction, eCommerce may not be the right distribution strategy. Sellers now have a larger market and consumers have access to a larger shopping catalog. It’s easier than ever to match willing sellers and buyers with unique items. Unique products that are desired by a small number of people around the world are often a perfect fit for eCommerce. A single geographic location may not be able to support a niche product but eCommerce erases this particular retail roadblock. Material, weight, size, comfort and other characteristics of a product may be easier to experience in person. Companies are performing some interesting actions to address these issues. Augmented reality is used to see what an item would look like in the shopper’s house and free returns help lower the risk if the item turns out not to be what the buyer wants. Not all customers feel comfortable entering financial data online, have the ability to accept deliveries or trust stores in which they cannot see or talk directly to a person. Other shoppers are not tech savvy in general, do not have the capability to shop online or have access to bank accounts, credit cards or other ways to pay. Age, income, occupation, gender and other demographic characteristics can help retailers determine what their target audience is able or willing to do online. Local laws, taxes, and regulations may also influence how and what people purchase online. Ideal customers are tech savvy, enjoy shopping online, and have the means to access your store, pay and accept deliveries. As people who grew up in a digital-first world start making more buying decisions, a higher percentage of shoppers will feel comfortable choosing to buy online. Do I need this product now, in two days, next week, or next month? If my products arrive late or damaged, what will I lose? Do I have other options? Can I accept packages where I live/work? Customers’ specific situations have an enormous impact on what they expect in a shopping experience. When does the customer need the product? It’s commonly understood that some products are needed right away while others are not. Retailers trying to supply products to those in need of quick delivery will use a different business model than retailers serving customers happy to wait two weeks. Just because a product can be shipped in one business day does not mean the customer needs it that quick and they may prefer to pay less for a long wait. Other times, customers may pay almost anything to receive the product the same day it’s ordered. Some products or target audiences fit well with a business model that provides quick delivery and others will not. The customer’s shipping address determines the cost, safety, availability, speed of delivery and demand for a product. Delivering to rural Alaska is much different than to downtown Manhattan. Delivering to Malibu, California involves different risks than delivering to the Eastside in Detroit. A cup of water in the open desert would demand a different price than a bottle of water next to a drinking fountain. Does the customer require a perfect product and delivery? How certain that the product is correct does this item need to be? If it is a day late, damaged or the wrong item, will that be an issue? Will an inspector fine the customer if the product is not correct? Is the product needed for a wedding or another important event requiring perfection? Does it need to arrive before the customer leaves on a trip? These questions will likely have an impact on how much additional risk the customer is willing to take when shopping online to save time or money. If the shopper goes to the brick and mortar store to pick up the item, they can be sure it is what they want, in the right color, not damaged and a perfect fit. Delivery from a web-only retailer includes new risks. A better price or larger selection may not be enough to entice shoppers online if they have a lot to lose if the item is incorrect. Even if eCommerce stores deliver the right product to shoppers 99% of the time, that may not be sure enough for all situations. As new technology, business models and customer preferences emerge, stores must keep up with modern consumers’ shopping habits. It is important to understand these changes as retailers strive to create a better customer experience. If retailers lose focus, they may end up obsolete like Blockbuster Video, Borders Bookstore or newspaper classified ads. In order to keep current customers and build better retail experiences, retailers must understand the new retail landscape and in which directions the changes are headed. Business models, technology, and customer preferences are constantly changing and retail must change with them. Grasping the direction these changes are advancing towards and the specific areas of retail that will be affected will continue to grow in importance as more changes occur within a shorter and shorter timeframe. These changes will encourage new and better ways to fit more products into the eCommerce equation. Amazon offers about 370,000,000 products, as of December 2016, compared to the two million books they offered in their early days. Retailers will slowly be able to provide better experiences through the use of technology, innovative business models, and the understanding of current customer preferences and in the process, products will increasingly be purchased in new ways, many of them online. Retailers must understand the changes happening in these three areas in order to comprehend the impact they will have on future business. By utilizing creative thinking, retailers can stay relevant to the customers, situations they serve and the types of products they are currently selling and find new products to offer their audience if necessary. eCommerce allows new types of stores to open with more to come. Many niche stores could not survive in any one geographic market but have a much better chance to be successful online. No single city holds very many customers with an interest in a shop solely selling emergency eyewash stations but entire online stores can be dedicated to this product line. EyewashDirect.com provides users around the world access to leading experts in the field as well as a product selection and an information-rich site that no individual city could match. No single geographic market could support many of the niche stores that now exist online. eCommerce stores often have a national or global reach. Sales from products that attract only a few customers per geographic area would not be able to support a brick and mortar store, but when combined, there are plenty of customers for a store that has a larger geographical reach. Online stores can serve one or one million customers at a time with one website or app. Brick and mortar stores have limited stock and storage space in contrast to a website that can have virtually unlimited visitors or products and little change to the shopping experience. Retail chains and big box stores such as Wal-Mart and Best Buy need individual stores and have a fixed storage space, location limitations, and a finite number of cashiers. Large online stores can provide the selection, price, and convenience most people need on a scale that traditional retail cannot. Nowadays, just about anyone can set up an online store. The advanced programming that was needed in the 90s or the capital to rent a building is not required. 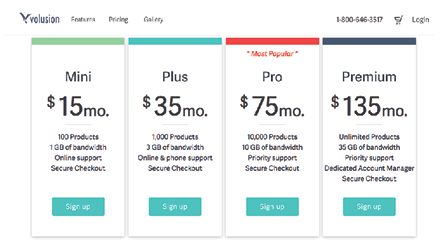 Dropshipping eliminates the need to purchase products to sell in advance and services such as Volusion allow users to set up a store for as little as $15 a month. Other services allow you to add online stores to your current website with the addition of a code snippet and PayPal allows anyone with a bank account and PayPal address to accept credit card payments without worrying about online site security. Large stores, small stores, and even individuals can also sell online without having their own website. eBay allows individuals to sell products around the world while only keeping a small fee. Craigslist lets people post any item they have, free of charge, while the transactions happen offline. Marketplaces are great for small retailers or individuals because sellers do not need to be traditional businesses or have special training. Simply by posting a product from your computer or phone, you can sell your products online. Many marketplaces have a very low barrier to entry and eliminate much of the need for marketing the products because of the built-in audience they have earned. It is equally important to look at new technologies as well as the new businesses built on top of them. Faster processors, high-speed Internet, and new devices are important to consider but they are only useful when businesses take advantage of them. 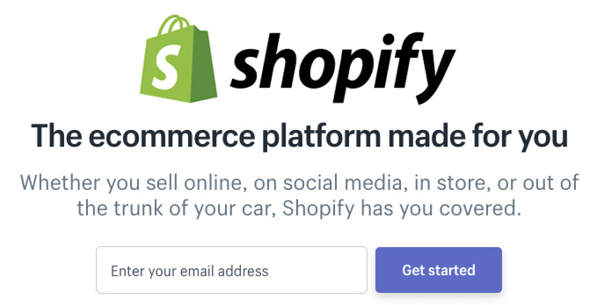 Companies such as Shopify and PayPal are possible because of new technology, however, new technology is useless without the programs, networks, devices and operating systems used on top of the hardware. Businesses models based directly on new technology influence retail areas including product design, manufacturing, and distribution as well as many other areas of eCommerce and business in general. Internet-connected devices are now available in more places, more often and with new types of displays, input and output. Connected phones, laptops, tablets, watches, speakers, microphones, cars and the Internet of Things, in general, affect everyone’s shopping behavior. New connected devices eliminate frictions, allowing new and better business models to spring forth. My son has two working laptops (costing a few hundred dollars, not thousands) and an iPhone, as well as access to a number of tablet devices. The days of the one-computer household are no longer the norm. Once the Internet of Things is in full force, shoppers will have access to additional devices that will guide shopping habits in ways that are not currently imagined. High-speed Internet and faster computer processors allow us to connect in seconds instead of minutes. Compare this with the typical time it once took to get online. You had to go to the one room with a desktop computer, turn it on, wait for it to boot up, wait for the dial-up modem to connect, and finally get Netscape Navigator to load. Then there was a few second wait for a text page to load and 30 to 40 seconds for an average image to load. Slow Internet speeds affect time spent online and shopping is no exception. Many people will leave a site if it takes a few seconds too long to load. Amazon notices changes in site conversion rates with as little as tenth-of-a-second fluctuations. Internet access is available almost everywhere we go on a day to day basis. We can shop in the woods, at home, the car or online at a completely different physical store. Increased Internet access influences when, where and how customers choose to shop and in turn what they end up purchasing. As the Internet continues to become more prevalent and affordable around the world, new businesses and norms will spring up to accommodate the specific retail needs in these areas. New technology and business models make it easier than ever to set up an online store. They remove much of the risk involved in starting a store because the capital to hire a programmer or find a way to accept credit cards is no longer needed. The CD Baby store was started in the late 90s because the founder wanted to sell his CDs online. He had to learn the programming required for eCommerce plus put in months of work just to be able to accept credit cards. In the late 90s, retailers expected to make a much larger investment of time and money to sell online. Services such as Shopify and PayPal did not exist and retailers either needed to know how to code or have the money to hire a programmer. As mentioned earlier, technology and business models are always changing, but so are customer expectations. In many cases, they each drive and influence each other. Before the Internet, shopping online would not have been possible. This is clearly an example of technology driving the business models and customer norms. Sites such as eBay allow anyone to sell online as a new business model that influences what we can buy and who will sell it to us. However, new customer habits and norms need to be established, not just new technology or business models, in order to see change. Norms and preferences are constantly in flux. Ideas spread around the world through faster communication and more media options that influence where people shop, how they make purchases, and what they care about when it comes to the retail experience. Some shopping preferences may be part of a customer’s nature, others are just current local trends and still, others are due to changing demographics or personal experience. Some shopping norms are influenced by media or pop culture while some are affected by economic or political situations. As people become more familiar with shopping online, they often begin to trust the Internet with their payment data and trust new stores and online marketplaces in general. People’s fears about shopping on websites often diminish as they have positive experiences. New and better ways of keeping data secure are now common. It is not unusual to see a number of security symbols on eCommerce sites indicating that they are working to eliminate fear by using trusted third parties to demonstrate their sites are safe. This may be less of an issue than in the past, but many stores still use these signals to encourage the customer to trust that their data is safe on their site. There have been a number of data breaches in recent years at retailers such as Target and new concerns about cybersecurity pop up in the news each week. If enough individuals have a bad experience or the media continually reports on people who have been taken advantage of, the norms around online security and trust could change. Shoppers have evolving expectations when it comes to shipping and returns. If a retailer sells with a low margin, sells products that are expensive to ship, or experiences numerous product returns, it may not be possible for them to compete online at an affordable price in a world where free shipping and returns are expected. This is a cost for the retailer, but customers are becoming accustomed to receiving free shipping and returns from some shops. 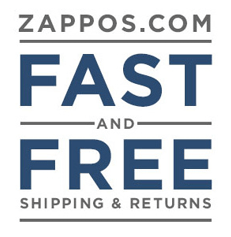 Stores such as Zappos have free shipping and returns for up to a year and this can cause people to expect this from every eCommerce experience. These changing expectations can have a real impact on competing stores’ business models as well as stores in other industries. Shoppers now expect a wider selection of products and the exact item to fit their needs. If the perfect product is a few clicks away, not a twenty-mile drive, people will not need to settle for their second choice. Zappos claims to have 17,755 options for men’s shoes and this is just one place online to buy shoes. That is more than anyone would find at their local Foot Locker or any other physical shoe store. Imagine how many options are available when visiting multiple stores in multiple countries around the world. Now that these new choices are presented, finding the right option is much more difficult. Discovery is much more important when we have an unlimited selection to choose from. Finding the perfect item can be difficult. It’s not hard to choose the right snow shovel at your local hardware store that has only three to pick from but now there are hundreds online to compare. Customers no longer need help finding products to buy but do need assistance sifting through the numerous options to locate the item that fits their specific needs. This will become more and more significant as frictions are eliminated from the buying process. Websites such as thewirecutter.com do an effective job of curating their offerings to help customers choose “best of class” products. Consumer Reports has been doing this for years, as well. Honest.com helps parents and families discover safe products for the home and would be a much less useful site if they added products that were not curated for the natural-product-loving parent. The fact that a product is on the Honest.com site is curation enough to know the item is safe for your family. Many mission-based companies are appearing in all sorts of industries. Consumer demand for mission-based stores influences the types of products sold, the goals of the company and the treatment of the workers and suppliers. Fair Trade Certified products such as coffee fetch a premium and encourage business owners to start and grow a mission-based business. As consumers change their beliefs about who should receive help or what mission is now important, business models will change accordingly. Both the number of customers that care about mission-based purchasing habits as well as the specific mission they care about will change over time. TOMS donates shoes to children in need with every purchase and giveonemeal.org donates a meal for every item purchased on Amazon.